How can I add a Favicon to my Store? A favicon is a simple graphic icon that can be added to any website and will display on the tabs and title bars of most browsers when viewing the site. Favicons will also display on visitor's bookmarks and browser history listings and help your site stand out a bit better when listed among other sites. The favicon HTML tags to add to your site's frame template. Any HTML or text editor such as notepad.exe or Dreamweaver. The favicon.ico file can be created in a variety of different ways. Most photo-editing programs will have free plugins available that can be used to create your file and save it in *.ico format. There are also many free online favicon generators that can be used to create your favicon.ico file. A simple search online should lead you in the right direction. Be sure to name it favicon.ico since some browsers rely on this specific name in order to display it correctly. Generally speaking, the image used for your favicon should contain sharp edges, colors, and be in the 16x16 pixel range. Check out some popular sites like wikipedia, google, facebook, amazon and others to get some ideas. Navigate to your FTP server's "web" folder. Upload the favicon.ico file to the "web" folder. Please review our articles on using FTP for information on connecting to your site's FTP access. Your favicon should display now on your browser page's tab! In some cases, you may not see your favicon right away. The favicon file and its display are very dependent on cached internet files, so you may need to clear your browser's cache information before it will be viewable. Most browsers allow you to clear cache by using the CTRL+SHIFT+DEL keys on your keyboard. After clearing cache be sure to close your browser, then re-open the browser and try again. If you are still unable to see the favicon, try a different browser that you normally don't use or simply wait a few hours for the cache to update organically. It is also worth noting that you may need to clear your store's cached files in order to have the edited frame file display correctly for you. 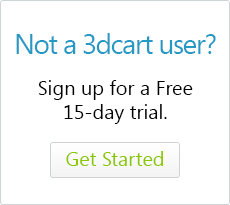 The store's cache can be cleared by clicking on the "View Store" link inside your 3dcart Online Store Manager..